This morning at 8m Finnish time (UTC+2) Nokia released its “Interim Report for Q1 2017”. Nokia performed better than expected in the first quarter of 2017, with lower losses and better results from the Nokia Technologies business. 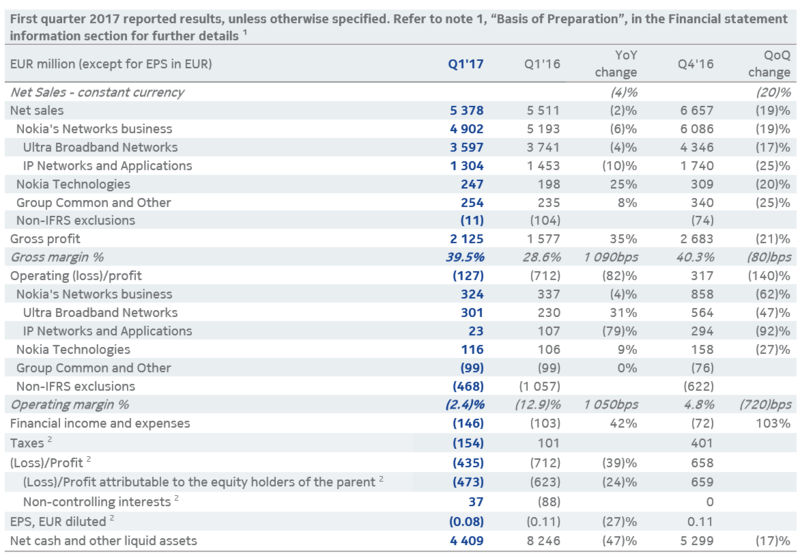 By the non-IFRS standard of reporting, that excludes non-business related costs like acquisitions, restructuring, goodwill impairment charges and others, Nokia posted €5.388 billion in revenue, with €203 million profit after taxes and other financial expenses. That translates to 4% decline in Year-on-Year revenue, but thanks to a lower tax rate, a 46% YoY increase in profits after taxes. Nokia pointed out that the company slowed down the decline in the core Networks business, with particularly strong performance in Mobile Networks. For most consumers the most interesting part of Nokia is Nokia Technologies. Even without Apple as one of the major clients for Nokia patent licences, the Technologies unit grew 25% on YoY basis gathering €247 million in revenue, with a 9% YoY profit increase that sits €116 million and a 47% profit margin. The higher net sales was primarily related to an IP agreement expanded in Q3 2016 (Samsung??? ), brand partnership with HMD, new patent licensing agreement signed in Q1, and the sales of Withings products. Nokia notes the absence of licensing income related to certain agreement, and we well know that’s Apple. Nokia is in an open patent war with Apple that will cost the company up to €100 million annually, but Nokia is confident in a positive outcome. Without Apple as one of their biggest licensing partners, Nokia expected an €800 million revenue for Nokia Technologies in 2017, but thanks to new patent agreements and the HMD deal, Nokia Technologies could well outperform expectations. 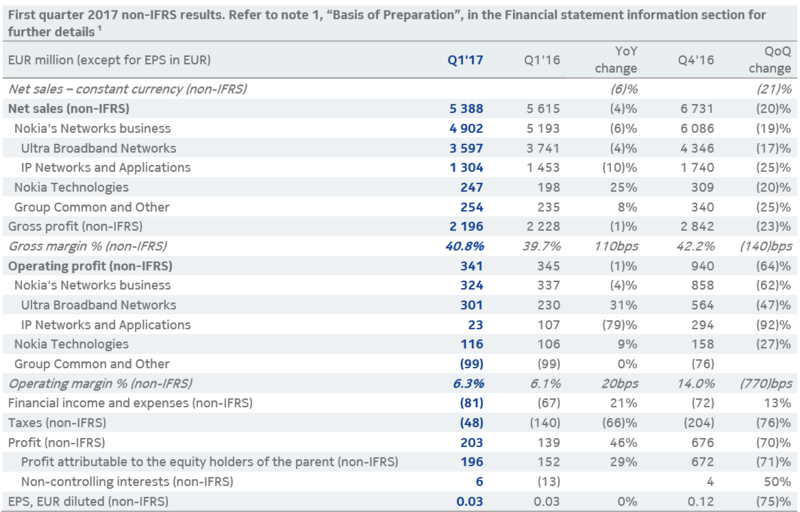 The Company overall, as reported by IFRS standard, posted a €435 million loss, caused by the Alcatel-Lucent acquisition and integration, debt repurchase program and other impairments, but the loss is 24% lower compared to Q1 2016. To sum up, Nokia beat market expectation posting higher than expected profit, but missed the expected revenue by €350 million. CEO of Nokia Rajeev Suri said:”We slowed the rate of topline decline and generated healthy orders in what is typically a seasonally weak quarter for us… We saw encouraging stabilization in Mobile Networks topline,” and adding “I am optimistic about the year ahead, even if cautiously so.” It’s interesting that HMD started paying brand licensing fees to Nokia, but unfortunately we cannot calculate approximately how much HMD paid, because of lack of information. The only thing we know about the payments is that they are based on the percentage of sales/profit, and not a fixed amount per device. Based on the report of HMD’s manufacturing partner FIH Mobile, we made some assumption about the size of HMD’s orders, so if you like calculations and assumption take a look here. 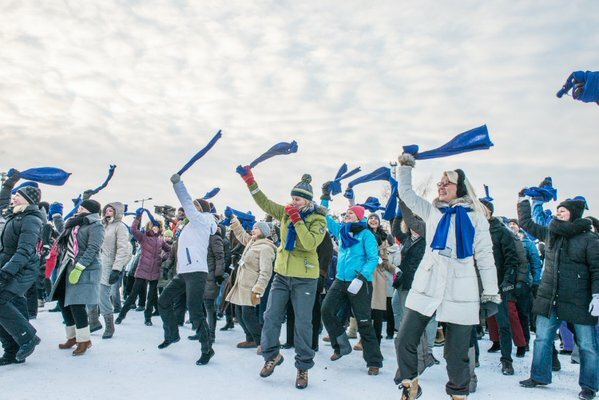 We will update the article with the reaction from Helsinki Stock Exchange once it opens. 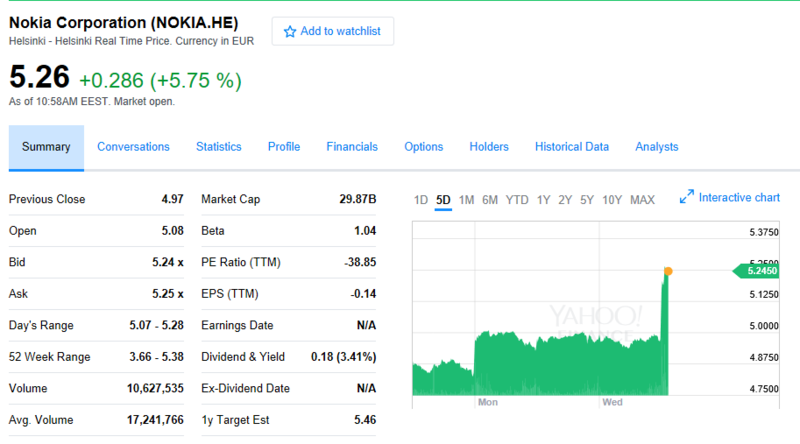 Update: Nokia shares on HSE up 5% after financial report release.